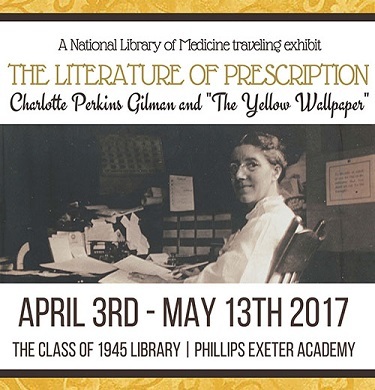 The Literature of Prescription: Charlotte Perkins Gilman and "The Yellow Wallpaper"
The Class of 1945 Library will host the National Library of Medicine's traveling exhibition The Literature of Prescription: Charlotte Perkins Gilman and "The Yellow Wallpaper" April 3rd to May 13th, 2017. In the late nineteenth century, at a time when women were challenging traditional ideas about gender that excluded them from political and intellectual life, medical and scientific experts drew on notions of female weakness to justify inequality between the sexes. Artist and writer Charlotte Perkins Gilman, who was discouraged from pursuing a career to preserve her health, rejected these ideas in a terrifying short story titled “The Yellow Wallpaper.” The famous tale served as an indictment of the medical profession and the social conventions restricting women’s professional and creative opportunities. This exhibition is part of the National Library of Medicine, National Institutes of Health traveling exhibits programs and was curated by Manon Parry. 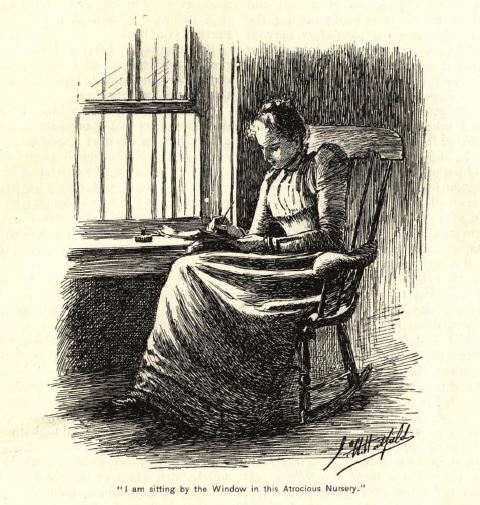 The corresponding online exhibit and learning resources can be found on the NLM website: The Literature of Prescription: Charlotte Perkins Gilman and "The Yellow Wall-Paper." Book digitized by Google from the library of Harvard University and uploaded to the Internet Archive. View may be enlarged; use full-screen icon below. Charlotte Perkins Gilman’s “The Yellow Wallpaper” tells the story of an unnamed woman who is sent to a country home for rest and forced solitude in order to cure her of a nervous condition. While there she imagines that there are women trapped in the bedroom’s yellow wallpaper. In this talk, I’ll discuss the nineteenth century’s “cult of true womanhood” and Gilman’s use of the wallpaper to symbolize the horror of domestic space. "Why I Wrote 'The Yellow Wallpaper'"
"Why I Wrote the Yellow Wallpaper?" This article originally appeared in the October 1913 issue of The Forerunner, a monthly magazine produced by Charlotte Perkins Gilman from 1909 through 1916. Originally published in The New England Magazine, January 1892. Animated Version of "The Yellow Wallpaper"